Do you ever wish you could slow down and and really see the beauty of the world? Bird watching is a fine way to start, and Mesa County Libraries has a lot of great ways to help you. 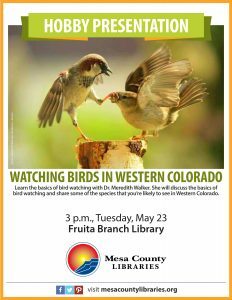 Watching Birds in Western Colorado, a presentation by Dr. Meredith Walker, is happening Tuesday, May 23 at 3 p.m. at the Fruita Branch Library. Also, check out the WildCO app, a handy mobile app for wildlife identification, and our Western Wildlife pages, which are part of our 970West Digital Collection. For even more info, check out the Birding by County website for maps and locations for swell birding fun. Life’s tough sometimes, get outside!